As monopolies, utilities have certain advantages that give them a leg up in the marketplace against third-party solar companies. They already have proprietary system knowledge that allows them to install DG strategically, making more attractive offers to customers in areas where installations would save them the cost of other system improvements. In addition, they have strong brand recognition and an existing relationship with their customers which allows for significant marketing cost savings. Moreover, the utility is granted by the Corporation Commission the opportunity to obtain a certain rate of return by charging all its customers to recover the cost of its investments. Private solar companies, like AEE members SolarCity and Sungevity, do not enjoy these advantages. Yet they’ve been operating in the Arizona market for years by offering financing packages such as solar leases and power purchase agreements. The average SolarCity or Sungevity customer saves about $20 a month by having solar on their roofs rather than buying all their electricity from the utility. Their fear is that utilities could undercut these prices - subsidized by all utility customers - and shut the solar companies out of the market. In July, Arizona Public Service (APS), the largest regulated utility in the state, submitted its 2014 RES Implementation Plan, in which APS asked the ACC to approve AZ Sun DG - a program that would install 20MW of solar on 3,000 homes - as part of its renewable energy compliance plan. The solar systems would be owned by APS, which would pay customers $30 per month, significantly more than the average independent solar company could offer in savings, for use of their rooftop. Unlike a private company, the utility would pay for the program through charges to its other customers. ACC staff recommended that the Commission reject APS’s proposal, but left the door to utility ownership of DG open. As evidence that Arizona’s competitive solar market is booming without utility ownership, the staff report noted that the AZ Sun DG program wasn’t necessary for APS to achieve its Commission-mandated solar energy targets. The solar market is growing fast enough without it. According to the Staff report, APS customers, through third parties such as Solar City and Sungevity, have installed 18.1 MW of residential solar in the first three quarters of 2014, and staff believes it is reasonable to assume comparable amounts of DG capacity will be added in 2015. Staff said it did not make sense to rate-base the costs of DG when customers were financing them on their own. In fact, according to GreenTech Media, 66% of those projects installed received no state incentives or rebates. In contrast, ACC staff estimated that AZ Sun DG would cost ratepayers up to $66 million in 2016 dollars. 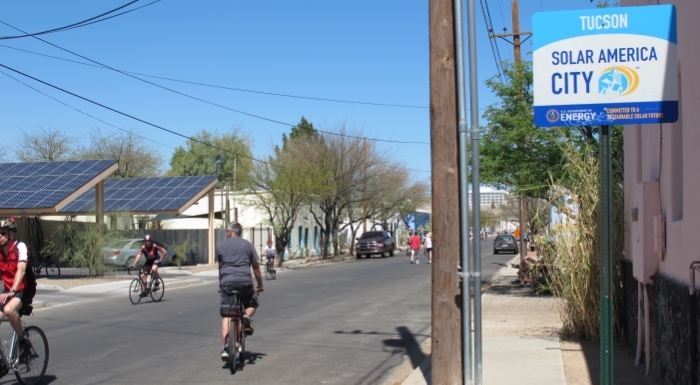 While the current growth rate and cost trends in the solar industry will be enough for APS to meet its renewable energy goals, Commission staff did not believe the same was true for Arizona’s second largest utility, Tucson Electric Power (TEP). TEP asked the Commission to consider a similar proposal for a much smaller, 3.5 MW distributed solar program. The program would put utility-owned solar panel systems on approximately 600 homes at a cost of $10 million. For an initial processing fee of $250, participating customers would be able to fix their electricity bill for the 25 year useful life of the installation as long as usage did not increase by more than 15% during that time period. ACC Staff recommended that the Commission approve TEP’s proposal. The Arizona Corporation Commission is expected to rule on the utility distributed solar proposals soon. This dispute is far from over - in Arizona, or elsewhere.